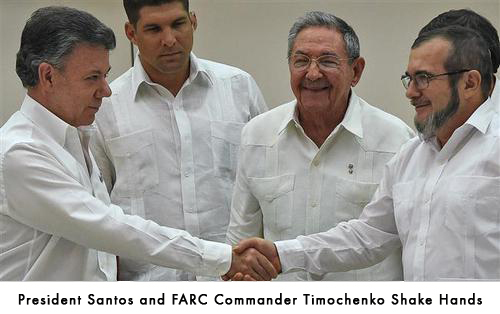 Workers Uniting, the 2 million member global union formed by UNITE the union and the United Steelworkers (USW), congratulates all parties in the Colombia peace process for the efforts that led to the historic handshake between Colombia President Juan Manuel Santos and FARC Commander Timoleon Jimenez ‘Timochenko’ on Wednesday 23 September 2015. The commitment to sign a final deal by March 2016 and to bring to an end the tragic conflict that has lasted five decades offers hope for a better future for millions of ordinary Colombians. During the conflict hundreds of thousands of innocent people have been displaced, threatened, imprisoned and killed, including human rights workers, Afro-Colombian and indigenous leaders, and of course our fellow trade unionists. There is no doubt that years of international campaigning have played a key role in helping to create the conditions for peace, and in this respect Workers Uniting pays tribute to the trade union campaign Justice for Colombia for all the path breaking initiatives it undertook to help the process reach this point. Workers Uniting also salutes all the MPs and trade unionists involved in the Northern Irish peace process who also repeatedly travelled to Colombia and Havana to share their experiences and aid the process, there is no doubt their assistance was invaluable. Workers Uniting calls on the international community to remain fully involved and ensure that the agreements are respected and adhered to. There must be no repeat of the 1980s when those who laid down their arms and entered the political process were systematically murdered alongside thousands of other opposition members. We call on the government to confront the existing paramilitary groups and encourage the parties to agree a bilateral ceasefire as soon as possible. Workers Uniting recognises there is still a huge amount of work to do in building a civil society which can operate free from persecution. We will continue to remain fully involved in supporting and developing the Colombian trade union movement. In the meantime Workers Uniting calls on the Colombian government to immediately release political prisoners such as Huber Ballesteros – the falsely accused leading member of our sister union Fensuagro. This entry was posted in Blogs, International Trade Unions, Labour Party, Media, Politics, Solidarity, Trade Unions, Trades Union Congress, Unite The Union, Workers Uniting. Bookmark the permalink.